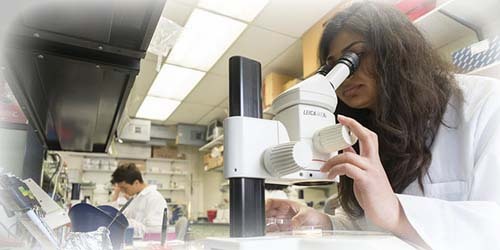 Our highly collaborative graduate programs in Biochemistry & Biophysics, Microbiology or Molecular, Cellular & Developmental Biology provide support for domestic and international students from a variety of educational and ethnic backgrounds to obtain their PhD. With both classroom instruction, and personalized training in the research laboratory, we prepare students for a wide range of careers in the life sciences. Upon completing their degrees, our graduates go on to successful careers in academia and industry. Our graduate education philosophy emphasizes rigorous, creative research. Students complete their dissertation by carrying out cutting-edge research, and develop an original body of work publishable in high-impact, peer-reviewed research journals. A key strength of our graduate programs is the diversity of research questions investigated by members of the department. We provide a wide choice of possible advisors , and a range of research avenues . In particular, the broad base of research in the department facilitates interdisciplinary and collaborative graduate education and training. Use the links to the left to get more information about how our different programs, research areas, faculty and resources make KU a great place to get your graduate education. When you’re ready, you can use the link below to apply to our program.